Catching A Bus in Grenada Fun! 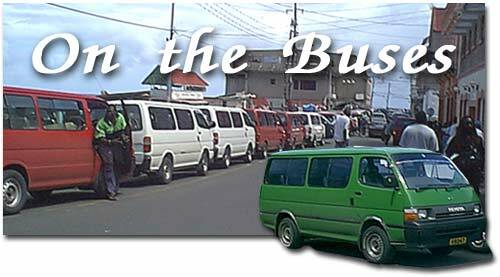 Buses in Grenada are a useful way of getting about: they are an excellent local supplement to more long distance island tours that stop at specific destinations. For getting from the hotel to the strikingly beautiful St. George's, they are ideal. On weekdays, that is... buses disappear on Sundays. Like most Grenadians and their dogs, I think they go to church. If you come from Europe or America, our buses may take a bit of getting used to. They may even take a bit of recognising. Names? Oh yes. Most buses are privately owned, and are embellished with a name, and sometimes with slogans, front, rear, or both. Some current southern buses include: Humble they self - Too much ah dem - Nothing yet - My enemy is not necessary - Final Assassin (I am not aware of any penultimate assassin) - Scare dem - Bite dem - Celebrate - Take that and push it. You get the idea. Bus spotting here is much more fun than train spotting. Party game, not just for children: make sentences linking what is written on buses? If the bus seems too full to get into, then get into it anyway. If it has stopped, there is room. The bus knows best. You may be gestured to fit into the gap between two seats, for which a little bridging cushion is provided. There is unlikely to be any conversation, unless the sound system has broken down. If you want to get out before the terminus, knock on the tin roof. NOT with a ring finger: if you scratch the paint, you'll never hear the last of it. If the music in the bus is so loud that it is impossible for the driver to have heard the knock, do not despair. The knock will be relayed on by the conductor (he’s the one nearest the door), and / or by other passengers. And the bus will stop, sooner or later, i.e. maybe instantly, maybe at the next bus stop, probably depending on whether the police are watching. As you get out, put $EC 2.50 into the hand of the conductor. 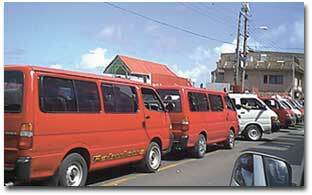 The fare for any length journey between Grand Anse and St. George's is currently $EC 2.50. For the return journey, the Grand Anse (hotel belt) buses can be found at the bus terminal, on Melville Street in St. George. As soon as you approach, eager conductors will try to get you on their vehicles: the first full bus is the first to leave. If you want to go further afield by bus, then you can, but buses thin out north of St. George's, and it is worth starting (and finishing) your journey early: buses back to St. George's stop running at about 5.00 p.m. The Grand Anse route continues to operate up to more like 9.00 p.m. If you are staying at Rex, Calabash, Sandals, Secret Harbour, or any of the L’Ance aux Epines (‘Lancer Peen’) accommodations, you need to get to Grand Anse before ‘plugging into’ the bus service: they only run along main roads. Sorry! All routes are circular. Buses will depart and return to the starting bus terminal. Number 1 - St George/Lagoon Road/Grand Anse/Calliste. Number 2 - St George/Springs/Woodlands/Woburn. Number 2 - St George/Calivigny/Westerhall/Grenville. Number 3 - St George/Richmond Hill/Morne Jaloux/Marian. Number 4 - St George/Beaton/La Tante/Grenville. Number 5 - St George/Grand Roy/Gouyave/Victoria. Number 6 - St George/Grand Etang/Birch Grove/Grenville. Number 7 - St George/Annadale/New Hampshire. Number 7 - St George/River Road/Tempe/Mt Parnassus. Number 8 - St George/Cherry Hill/Fontenoy/Happy Hill. Number 8 - St George/Cherry Hill/Fonyenoy/Mt Moritz. Number 8 - St George/Cherry Hill/Beausejour/Brizan. Number 9 - Sauteurs/Rose Hill/Mt Rose/River Sallee/Grenville. So... get out there and enjoy. For the hotel to town journey, they are cheap, quick, colourful, plentiful and fun. Just don't take too much luggage on them, and do not expect any legroom. If you are at the front, you may have to keep getting out to let others out / on. The very front, by the driver, is a good place, though you do get a grandstand view of the roads and the other traffic, so it's not for the faint-hearted.